Once my son turned about eight months old, he was no longer content quietly nursing. He wanted to play, move around, anything but stay still. In general, he doesn't like to stay still, so this was no surprise. I have an active little boy! I've heard that once your child stops laying there quietly to nurse, that they should no longer be nursing. That is completely not true. My son still loves to nurse, he simply wants something to occupy him while he eats. 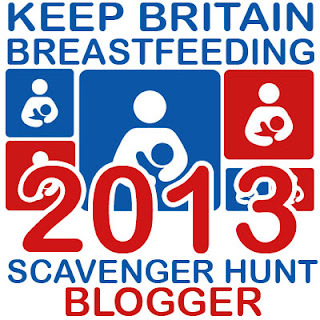 Something that has really helped is a nursing necklace! When I'm wearing a nursing necklace, he's busy playing with the different beads or pulling on the necklace. It keeps his mind busy while he's nursing, and he thinks it's fun! I think tugging on it is his favorite part, he's a little munchkin. 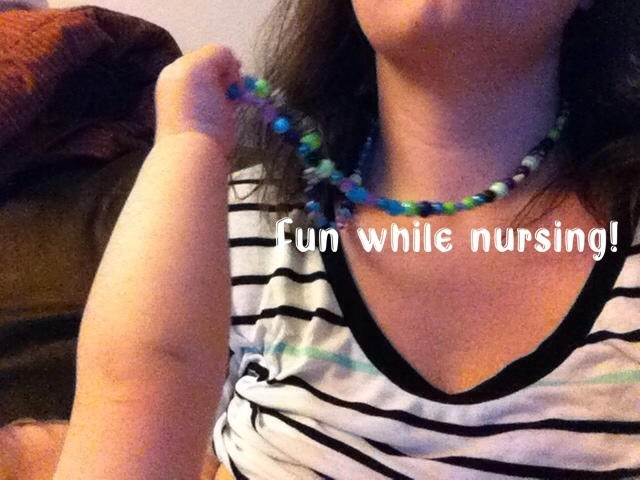 Luckily, the nursing necklaces from Baby Beads make me feel safe letting my (very strong) baby yank on the necklace. Baby Beads is a company run by someone that understands the safety of children, a mom. Jo (the owner of Baby beads) makes all of the necklaces by hand, and is sure that they are safe for mommy and baby. The beads are strung onto a very strong cord that has multiple knots. This makes the necklace strong, but also ensures that any breaks will result in the fewest amount of beads coming loose as possible. Great idea!! I can't imagine that the necklace would break though, and Jo has never heard of one breaking. There are many color choices available for these necklaces, and I chose the unisex aqua one. I absolutely love the colors! Lots of shades if blue, my favorite! The necklace is comfortable to wear (even when being tugged) and my son loves the texture of the beads. It's the perfect length for him to grab into it and play while he's nursing. If you're looking to keep your toddler (or active baby) still while nursing, I highly recommend a nursing necklace from Baby Beads! Check out the Baby Beads Website to see the necklaces available. Check out the Keep Britain Breast Feeding giveaway!